For some Plano residents, countertops may not be one of the top-of-mind elements to replace during a residential remodeling project, but the truth of the matter is the countertops in your home help convey your personal style and strengthen the aesthetic appeal in any room housing them. 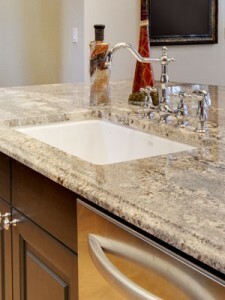 There are many options available as far as countertops are concerned, so if a time comes when you need a new countertop solution for your kitchen, bathroom or bar area, consider the natural beauty of granite. This highly durable rock is one of the most beautiful building materials available today, providing both a striking and functional working space. If it is time to upgrade the countertops in your home, contact TriStar Repair & Construction, the premier remodeling and construction company that installs granite countertops Plano, TX residents can enjoy for years to come. Granite has been a top-choice countertop solution for years in residential properties all over Plano, and it is no mystery why. In addition to providing a naturally beautiful look for any room in which it is installed, it is one of the strongest and most reliable building materials available in the home remodeling industry. Granite is a type of igneous rock that is formed due to the compression of magma over millions of years deep below Earth’s surface. Once hardened, granite is excavated from the earth at quarries all over the world in big blocks that are cut to size into workable slabs. The slabs are then cut and polished for installation in residential and commercial areas worldwide. The process of installing granite countertops is quite cumbersome, requires the proper tools equipment and can prove to be exceedingly difficult for do-it-yourselfers who do not have the proper training. That is where the seasoned team at TriStar Repair & Construction comes in handy. Trust us to professionally install granite countertops Plano residents can use and appreciate for a lifetime. for a majestic look when coupled with light or dark cabinetry. for a classically beautiful look when coupled with lightly colored cabinets. No matter what piece of the color spectrum you choose for your Plano granite countertops, you can count on TriStar to fit your home with added value and finesse with our professional granite countertop solutions. Since 2006, TriStar Repair & Construction has been fitting homes with granite countertops Plano residents have trusted for use in their kitchens, bathrooms and bar areas. Granite is a top choice for countertops because it is sanitary, heat-resistant, easy to clean, hard to chip or scratch, increases home value and fits in with any home’s décor and style. If you would like to replace your home’s countertops with TriStar’s top-notch Plano granite countertops, or if you would like to speak with a knowledgeable TriStar representative, contact us at (940) 381-2222.